We don’t like to rush our travels, so rather than catch the train from Waukesha to Chicago then go straight to the airport we thought we’d spend two nights in the city before flying to Vegas. I didn’t really know much about Chicago before went went – Mafia, pizza and cold winters was about it. We booked ourselves a twin room in a hostel which didn’t get great reviews online but turned out to be fine. It was in the Greek District, about a 20 minute walk from downtown. 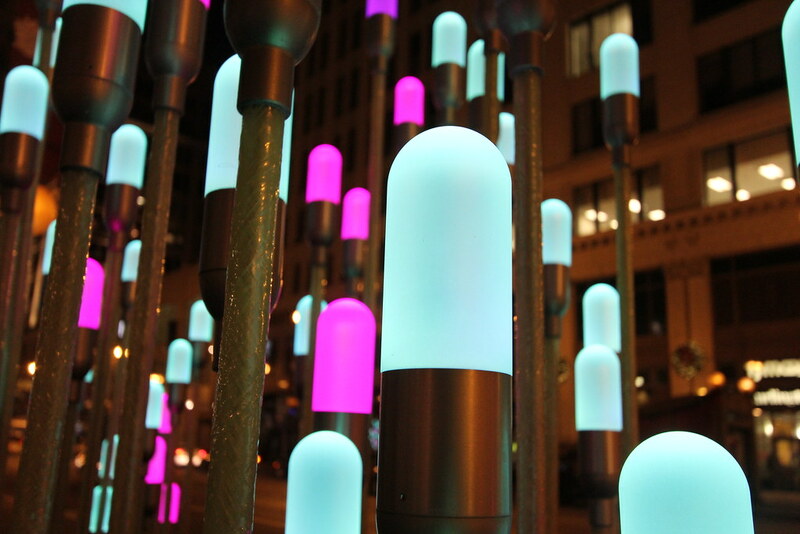 Downtown lights that had speakers next to them playing music. Despite getting recommendations from people about what to do and where to go, we didn’t end up doing anything touristy. We walked around the shopping strips and bought a few gifts to take home and some clothes that were on sale. 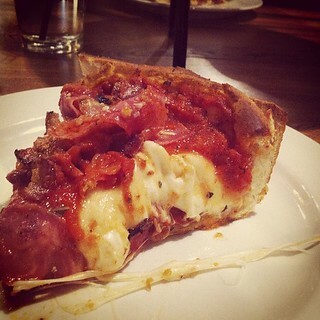 Our main goal was to try a proper deep dish Chicago pizza. In Australia our ‘deep pan’ pizzas are about half the depth of Chicago style ones. The Chicago pizzas have a crust maybe 3 inches high on the edge and the one we had started with a layer of meat and sauce, then about an inch of cheese, then more sauce then meat. It was really good – and despite looking quite different to ‘normal’ pizzas they taste pretty much the same – except you get so much more cheese. I loved it! They aren’t as enormous in circumference as NYC pizzas and because of their depth they retain heat a lot better. I definitely recommend trying them if you get the chance. Apart from that, our impression of Chicago was that it was super cold, the shopping was great and there were lots of interesting things in the middle of town. We came across a German outdoor market selling lots of hand-made things and delicious food. 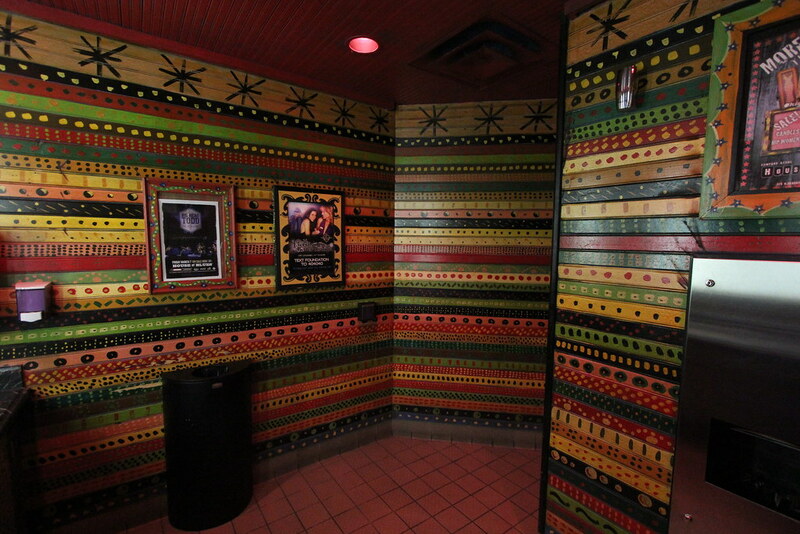 We also stopped for a drink at the House of Blues, an interesting folk-art style bar/club that was pretty much deserted mid afternoon but I really loved the decor. I didn’t take a whole lot of photos but it was an interesting city. If I got the chance I’d definitely go back and see the gallery, aquarium and museum. The only down side was the begging – but that’s pretty typical of cities in the US. All the big cities we’ve been to have had numbers of homeless people that I find hard to comprehend in a developed country. Far beyond anything I’ve seen in Australia, Europe or the UK. In fact even in Asia and most of Africa I wasn’t asked for money as frequently. We’ve had discussions with people we’ve met here about the reasons for it and there seems to be a common conception that many people find begging easier and, in some places, more profitable, than actually getting a job. Whether or not that’s true I have no idea, all I know is that it’s shocking and quite confronting. I’m not sure how long I’d have to live with it to become blase about it. WHen I was in Vegas for the OMP, like 11 years ago now, people were throwing around statements like ‘beggars in vegas make 80 grand a year”. I’d believe it too, at least for some of them. I reckon word got around because there’s so many there now I can’t imagine how that could be true… but anything can happen in Vegas!